Last year, we had 10 hives at 208 South Great Road: Eight on the Drumlin Farm side of the road, and two on the Mass Audubon Headquarters side. Since last summer, we’ve lost five hives. Considering last year’s drought and the subsequent lack of blossoming plants by the end of the summer, our losses were less than the average in the New England region. This season we have increased the total number of hives to 14. 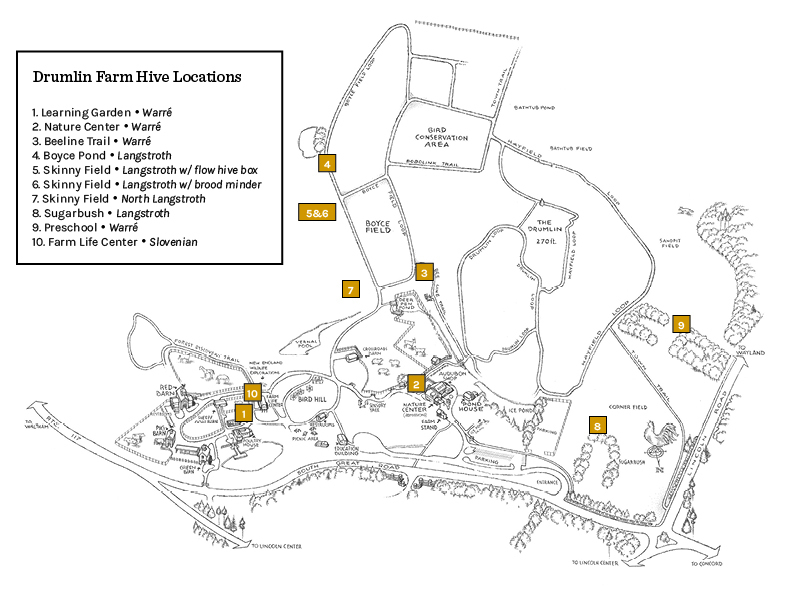 There are now 10 hives at Drumlin Farm and four at Mass Audubon Headquarters. 1. Learning Garden Hive (Warré): This hive is slowly building up its numbers. The bees have been active on the few warm days that we have had. 2. Nature Center (Warré): In early May, we installed a new package of bees in this hive and the numbers have been increasing steadily. The queen is doing her job. As with the other hives, the bees have been very active on warm days. Once the clover in the sheep pasture blooms, we hope this hive will take off as it did two years ago with the heavy load of pollen and nectar from the clover. 3. Beeline Trail (Warré): Both of these hives were lost last fall and the hives were removed. The Warré hive is back although it has been moved slightly to take into account groundwater issues. Bees were installed in early May and the hive appears to be doing well. 4. Boyce Pond Hive (Langstroth): We thought this hive was lost over the winter, but upon closer inspection it appears to have survived. We recently cleared some of the brush and growth around the hive to make it more visible and give the bees better access. 5 & 6. Skinny Field Hives (Langstroth)*: Both of these hives are doing very well—full of bees with good levels of honey stores. 7. Skinny Field Hive (Langstroth): The Langstroth hive that had been at the Beeline Trail was moved here, and bees were added in May. The hive is doing well and already required a second brood box as it has been expanding steadily despite the cool weather. 8. Sugarbush Field Hive (Langstroth): This is not a strong hive at this point. Hopefully, as the weather warms the hive will improve. If it does not, we may be able to add bees from some of the stronger hives. The other option could be to add a swarm, if available, to build up the number of bees quickly. 9. Drumlin Community Preschool Hive (Warré): This hive has been running for five years and is doing extremely well. The hive will need an additional box soon to forestall crowding, which leads to swarming. Since it’s a Warré hive with windows, the preschool children are able to look inside and see what’s happening. 10. 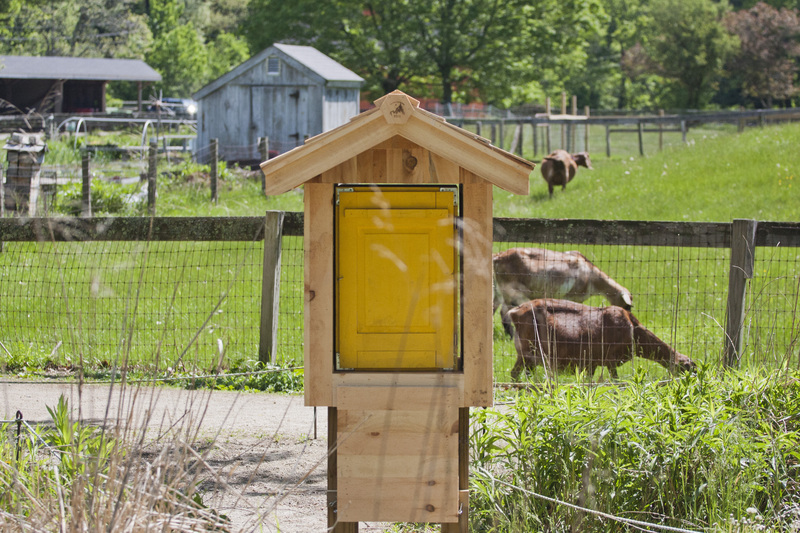 Farm Life Center Hive (Slovenian): This Slovenian hive, installed in a traditional kiosk structure, is the newest addition to our hive collection. Bees were recently installed, and once they have been established we will teach staff about the hive. The bees are behind interior screening so visitors can be shown the operation of the hive. We look forward to a good beekeeping year this season. Long-term weather projections for the summer indicate more precipitation and fewer high temperature days (above 90°F) then we had last summer. Hopefully, this will insure a sufficient amount of pollen and nectar sources for the bees as well as a better season for the output at the farm. We plan to start documenting the impact of the beehives on the output and success of the farm crops this coming year. If you have questions about any information in this update, or anything bee related, feel free to contact Mel. *I have been experimenting with mushroom extracts to treat varro mites and the viruses they transmit in both of these hives. Based on research done at Washington State University, I have been feeding both of these hives with two different mushroom extracts since last August. The WSU entomologists found 75% reductions in mite levels in the hives using these mushroom extracts and results from these hives are excellent also with extremely low mite and virus levels. I am very pleased with this non-invasive, natural approach to dealing with the mite problem and have started using the mushroom extracts to all of the hives. One of these hives has an experimental Flow Hive box on it. The flow hive box system, developed in Australia, allows for capturing honey directly from the box without having to open and disrupt the hive. I did not attempt to capture honey from the flow hive box last season, as the box was added late in the season and drought limited the availability of nectar. The flow hive box has a window that allows you to see the plastic flow hive frames and sometimes the bees. The other hive has an electronic monitoring device, Brood Minder, which will record hourly temperature and humidity levels within the hive. The information can be directly uploaded and used to assess hive maintenance and also is transmitted to a national database tracking the health of bee hives across the country. This entry was posted in Education and tagged beekeeping, bees, honey, honey bee, local, local honey on June 5, 2017 by Staff.